1/2 Chilean, 1/2 Peruvian - We wish to thank William Monohon of Willowmere Farm for allowing us to add Ariel to our Foundation Girl lineup for 2007-2008. Ariel is the offspring of one of our first foundation girls, Sweet Michela who we purchased back after we watched the incredible kids she puts on the ground from her breedings to Rockford. 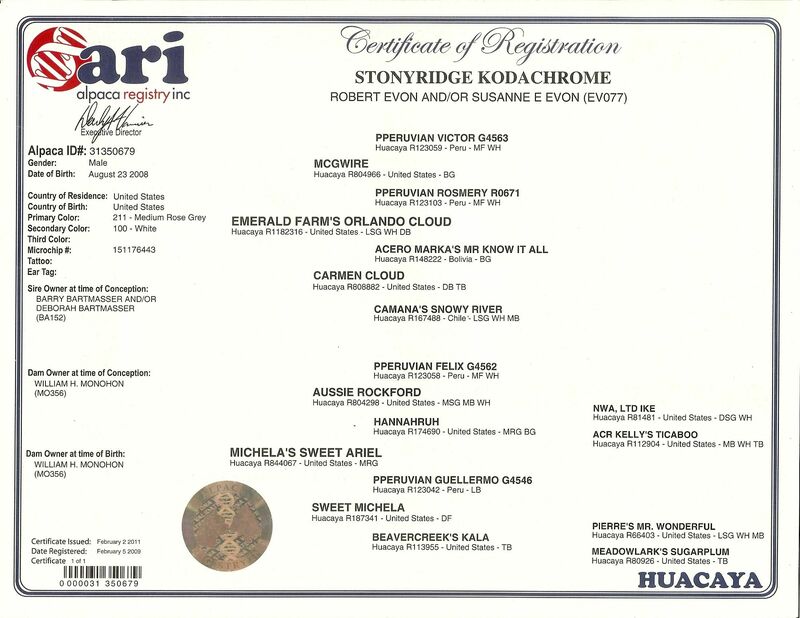 Ariel is the product of one of our first breeding decisions, and we had the good fortune to oversee her birth as Michela was sold, but agisted here for three years. We got to see Ariel grow up, turn into a gorgeous young maiden, and knock them dead in the show ring. 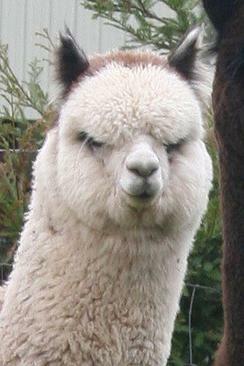 We have watched her produce three gorgeous cria from three different studs. She is truly a stunning girl, and when the opportunity came along allowing us to lease this amazing girl, we didn't think twice. KODACHROME has just won his second GREY COLOR CHAMPIONSHIP, this time on the East Coast at The Big-E under judge Stephanie Glyptis. KODACHROME was the oldest grey male being shown, at the age of 37 months. This is what we like to see- a male that maintains his elite crimp style, his fineness, his density and his consistency of all of these characteristics into maturity. KODACHROME is truly a MRG male who you should think about breeding your greys, and perhaps your fawns, to. 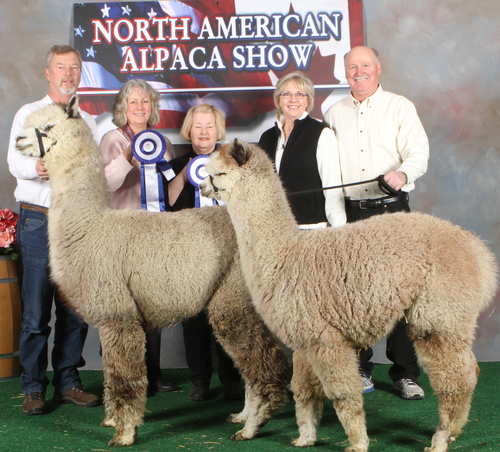 KODACHROME is the product of the pairing of Color Champion Sweet Ariel, and multiple Color Champion fleece and halter male, Emerald Farm's Orlando Cloud. KODACHROME had "it" from the time he dried off, and just continues to wow us. 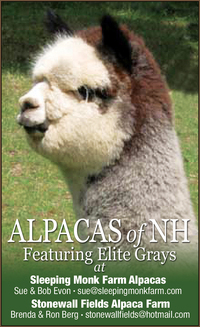 KODACHROME has the boxy, typey conformation we love, an amazing head, and fleece that is fine, dense, and crimpy in the luscious rose grey color of his dam. His dam Ariel is an Aussie Rockford daughter out of a Champion producing Guellermo daughter, Sweet Michela. Kodachrome's sire, Orlando Cloud is out of McGwire ( a full Accoyo Victor son) and one of the treasured "Cloud Line" Mr. Know It All daughters in the Emerald Farms breeding program. With the Victor bloodline & the Aussie Rockford/Felix bloodline, how could we go wrong? We couldn't, so we will breed KODACHROME to our ROSIE in the Spring of 2013! YOU CAN'T GO WRONG EITHER! KODACHROME IS AN AMAZING MALE WITH EXCEPTIONAL GREY GENETICS! 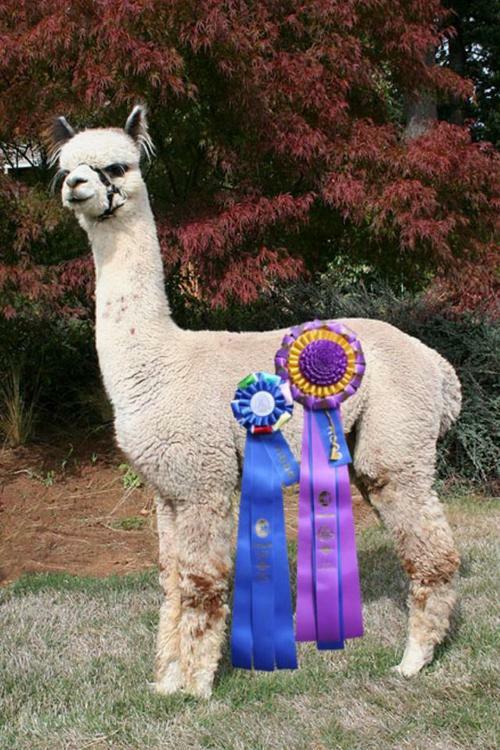 In the bottom picture, KODACHROME is shown with his first son to ever show at the NAAS 2014. 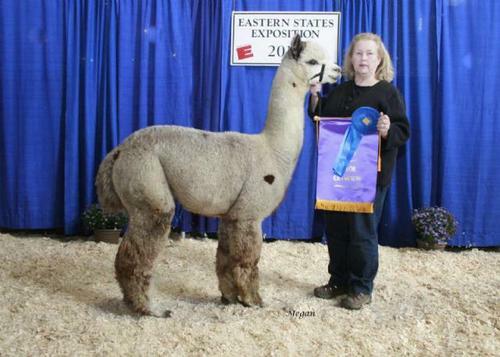 "CHAMP" is owned by Hampshire Highland Alpacas who co-own KANDOR with us. "CHAMP" is an amazing offspring from an amazing sire! Both earned Blue Ribbons under Judge Amanda VandenBosch. "CHAMP" at 8 and 1/2 months and KODACHROME at 5 and 1/2 years! 1/2 OWNERSHIP OPTION AVAILABLE! CONTACT US! COLOR CHAMPION at The Big-E, Oct 3, 2011. 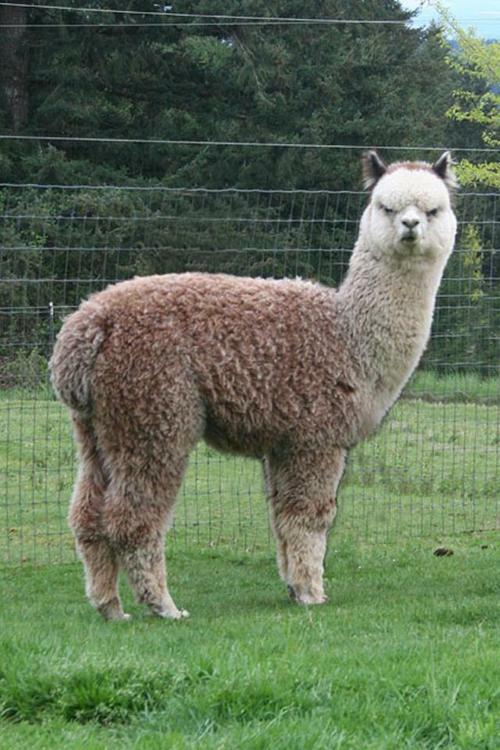 Oldest of all the males entered at 37 months of age. 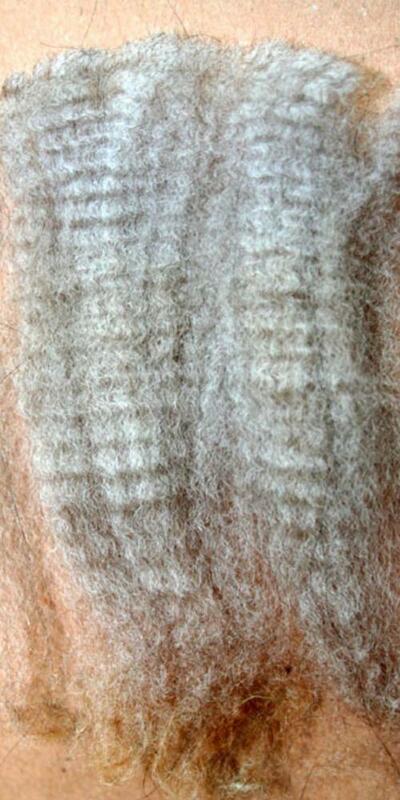 COLOR CHAMPION at the NEAF FLEECE SHOW...May 2013...oldest gray entry!